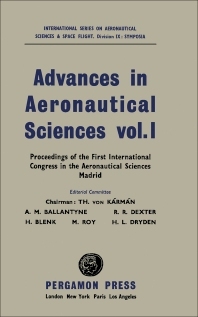 Advances in Aeronautical Sciences, Volume 1 contains the proceedings of the First International Congress in the Aeronautical Sciences, held in Madrid, Spain in September 1958. The book is comprised of survey papers and original contributions that discuss common problems in aeronautics and in space technology. The reader will also find interesting articles that cover topics on the principles of inertial guidance; boundary layer control; VTOL/STOL aircraft; heat resisting material; heat transfer and heat barrier; and jet noises and human factors in aeronautics. Hypersonic speeds; propulsion methods in space and magneto-fluid dynamics are discussed as well. Aeronautics engineers and scientists in allied fields will find the book insightful.